We had a meeting with govt yesterday, our RQA members, SABA, ASKSA were also there in support as I asked for the RQA’s to attend. Two modalities could not attend. Yesterday (19th January 2016) was not much of a surprise, although sadly disappointed with some issues, we run a democratic process and will always come back to you with the changes and how they really affect you and your members. Our grandfathering plan has been accepted and so you have benefited already because of our efforts. The Govt decided that the HWSETA will be the AQP (Assessment quality partner) and provide that service. This will result in a cost increase the Energy Healers Organisation NPO will move & work hard to reduce for our members. In short, there is a back up plan. This entry was posted in News on January 20, 2016 by SiteManager-Admin. So please, go to anyone you know and share the good news that they can help create five thousand jobs through us and in so doing help their quality of life improve by possibly even helping a family member become empowered through self employment and eventually jobs in other areas. We already help with Cancer patients deal with the effects and emotional issues, abused women and Tik addiction in Cape Town and with remedial classes at a Cape Town school. But more work is needed, not only in the towns and cities, but also the often-forgotten rural areas. We are happy to train helpers in their communities for free (unless they can contribute) and in whatever language is required. They may need to pay for travel and board, but we plan to travel to wherever is needed, once our more urgent funding requirements are taken care of. 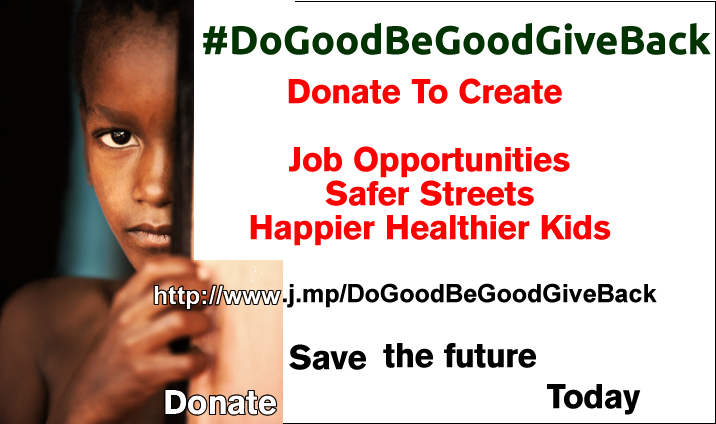 #DoGoodBeGoodGiveBack today and help make yourself a better future. The noblest thing a man can do is to give back to the society that formed him or her. and for as Little as R5, you can make a difference, today. This entry was posted in Fund Raising, Slider and tagged DoGood on November 21, 2015 by SiteManager-Admin.